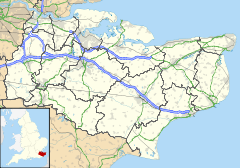 The site was first chosen by the then incumbent South of England ITV company Southern Television in 1979, and purchased the following year, for a proposed new studio facility should they win the Independent Broadcasting Authority contract for the new dual South and South-east of England region in 1981. However, following the loss of their franchise, they sold the site to the successful applicant Television South (TVS) at a premium. In fact it was part of the agreement between TVS and the IBA that TVS must provide a studio facility for the new South East region if TVS were to win the contract (although Maidstone was not specified by the IBA). The complex first opened in late 1982 and provided significant output for the company alongside long-standing facilities in Southampton (which they also purchased from Southern). The site was used frequently for production, as a regional office and as a newsgathering hub, with the South East daily edition of Coast to Coast being based here from the completion of the studio complex. A small studio located in Dover had been used on Friday evenings only to provide an opt-out News Service for Kent and East Sussex until Southern ceased broadcasting at the end of 1981. When TVS lost its ITV franchise to present licensee Meridian, the Southampton studios were sold to the new company but the Maidstone facility was retained, with a view to TVS becoming an independent production company. Meridian initially continued to rent space in the building as a production centre for the south east edition of Meridian Tonight, before moving to its own centre at nearby New Hythe between 1994 and 2004. The newsgathering operation returned to Maidstone Studios in 2004, though the studio for the programme moved to Meridian's new base at Whiteley in Hampshire. TVS, including the Maidstone Studios, was quickly bought by International Family Entertainment Inc. and the studios were used as an independent production facility. IFE subsequently launched a UK version of The Family Channel based in The Maidstone Studios, using some elements of the TVS programme archive. Flextech was a partner in the venture, taking a 39% stake in the business. In 1996, the studio complex was sold by International Family Entertainment Inc. to Flextech when it acquired the remaining 61% of the UK Family Channel business. During 2002 the new owner of Flextech, Telewest Communications plc, overhauled the structure of the operations which resulted in the disposal of the studios. The studios were bought in 2002 by a local consortium of businessmen under the name "Dovedale Associates" for £4.25m, headed by ex-BBC producer Geoff Miles. In 2005 a £2 million refurbishment programme took place, as part of "Dovedale Associates" business plans for the complex. A new Studio 5 (now known as Studio 1) was opened, which covers 12,000 square feet (1,100 m2) able to accommodate a 2,000-strong audience; it is now their flagship HD studio, and since April 2013 has been the home of BBC2's Later... with Jools Holland. From 2006 to 2012 a company called "TVS Television Productions Ltd" was based in offices at The Maidstone Studios. The name "Television South Ltd", "TVS" and the colour logo device had been re-registered to lighting cameraman Keith Jacobsen, who traded as an independent production company with no links to the original. The 'new' TVS ceased trading on 9 March 2012, but as of May 2017 is owned by another independent production company. The area including car-parks and outbuildings to the east of the studio premises were bought by Hillreed Homes - planning permission was granted in 2014 for 77 dwellings, and work to redevelop the site started in 2017. It is planned for vehicular access to the studios (including for production trucks) to be retained through the new housing estate. As of October 2017, Maidstone Studios is only advertising their two largest studios, and is no longer advertising the three other studios on site. Studios 1 and 2 have room for audience seating as well as room for sets. Studio 1 can handle 2,400 standing, 1,200 seated; Studio 2 can handle 250 seated. Both have large production galleries, are fully air-conditioned and can operate in SD or HD. Studio 1 also includes two large scene dock doors to allow easy access for people, scenery and vehicles. Access to Stage 2 is via the studio's scene dock area. The studios do not currently have any camera equipment other than a limited number of tripods and pedestals, and hence visiting productions are required to hire in equipment from elsewhere. Maidstone also has 4 edit suites, 1 dubbing suite, dressing and green rooms, production and wardrobe departments, scenery departments, transmission and playback facilities. On the Maidstone Studios premises is an award-winning data centre which offers rack space for servers for local, national and international companies. Until 2007, Radio Caroline broadcast from the complex. In 2010 Maidstone Studios was used for an anti-speeding TV advert, airing on ITV between 15 January and mid-February. Recently some of the old office space in Maidstone Studios has been converted into a fully functioning data centre offering rack space to local, national and international businesses. Since 2010, the University For The Creative Arts has taught television production within the office space and studio space. ^ "Maidstone Studios Official Opening Date". ^ "UK media group Flextech. (invests in UK Family Channel) (Brief Article)". highbeam.com. 7 June 1993. Archived from the original on 26 October 2012. ^ "Error - BestInvest". bestinvest.uk-wire.com. ^ "Investor group buys out Maidstone". broadcastnow.co.uk. ^ "Maidstone Studios wins Trisha series". broadcastnow.co.uk. ^ a b "Jools Holland moves show to Maidstone". www.kentonline.co.uk. Retrieved 22 April 2013. ^ "TVS Television - The Little Station with Big Ideas - based in East Sussex". tvstelevision.co.uk. 11 May 2017. ^ Kent Film Office. "Kent Film Office The Biggest Loser Film Focus". ^ Kent Film Office. "Kent Film Office Take Me Out Film Focus".